Sometimes a clock is more than just a clock. Richard and Erna Flagg were married in Frankfurt, Germany in 1932. Richard was Jewish, the son of a wealthy businessman. Erna was Protestant; her father, Bernhard Zubrod, was an architect. 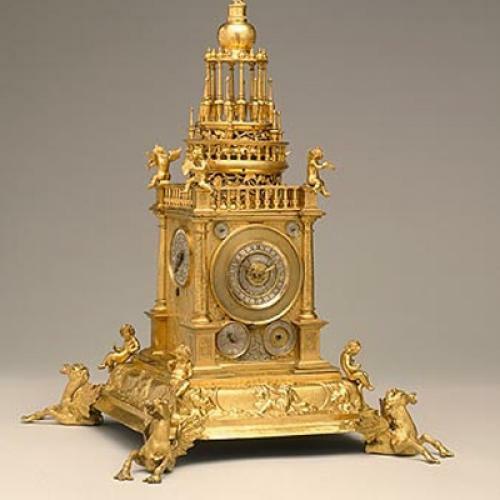 I had not heard of the Flaggs until a couple of years ago, when I first visited the Milwaukee Art Museum, and found myself lingering over a display of sixteenth and seventeenth-century clocks, fantastically intricate creations, which the Flaggs gave to the museum in the early 1990s. I would not be writing about the Flaggs and their clocks now, after another visit to Milwaukee, except that the story of how these clocks found their way into a great public collection is much more than a Milwaukee story or a Midwestern story. This is a story about the essential place of the artistic endeavor (and of connoisseurship and collecting and patronage) in a democratic society. There are many reasons to visit the Milwaukee Art Museum: fine architecture by Santiago Calatrava and Eero Saarinen; distinguished collections of twentieth-century art; important temporary exhibitions, including, just now, “Raphael: The Woman with the Veil,” which brings one of the greatest of all Renaissance portraits to Milwaukee, and “Street Seen,” a challenging show of mid-twentieth-century American photography. And then there are the clocks in the Flagg collection. It was another German Jewish immigrant who brought me back to Milwaukee last week, a man by the name of Abram Lederer, who opened a dry goods store in Milwaukee in 1862, and happens to have been the sculptor Alexander Calder’s maternal grandfather. I am in the early stages of writing a full-length biography of Calder, so find myself looking into his mother’s life, before the woman who was then known as Nettie Lederer took a modest inheritance and, defying her four older brothers, set off for Philadelphia and Paris to become a painter. There is nothing surprising about the fact that German Jews, whether Abram Lederer in the nineteenth century or Richard Flagg in the twentieth, were drawn to Milwaukee, that most German of American cities. For Richard Flagg, who only left Germany in 1939, and made his way to America after just missing extermination in Holland, Belgium, and France, Milwaukee was a natural place to reenter the tannery business, which had made his family wealthy in Germany. And once he and Erna were established in Milwaukee, it seems to have mattered not at all that their first collection of Renaissance and Baroque decorative arts, with its concentration of clocks, had been lost. Hitler might have nearly sent them to their deaths, but German culture was still a grand passion, and so the Flaggs began to collect again, on trips to New York and Europe, gathering the intricately engineered, sculpted, and gilded timepieces that had beguiled the royalty and aristocracy of early modern Europe. And then they gave these crazily elaborate concoctions to the citizens of Milwaukee. Old World extravagances became part of the New World museumgoing experience. I love the imaginative caprice of old clocks. The cases that enclose the tricky mechanisms include a wide range of fairytale forms: towers with delicately shaped columns and turrets; square or circular boxes sheathed in magnificent miniature bas-relief sculptures; a dromedary with a clock face inserted in a saddlebag; a clock in the shape of a revolving globe, with a dark-skinned Moor pointing a lance at the hours as they turn. All this playfulness, of course, has a sobering side, for the invention of the clock in the fourteenth century signaled a rationalization of the idea of time, helping to inaugurate what we think of as modern Europe. The art historian Erwin Panofsky—who was, like Richard Flagg, a Jewish refugee from Hitler’s Europe—mentions in his lectures on Titian that clocks, because of their well-regulated movements, were associated in the Renaissance with temperance, with the well-regulated life. And when I look at the clocks in the Flagg collection now, knowing that Richard Flagg nearly did not escape the Nazi machine, I find something all the more compelling about the story of this man and his wife, a Jew and a Protestant married in Frankfurt in 1932, who created, in Milwaukee half a century later, a celebration of the early history of the clock. The fascination of these clocks, which is surely artistic and technological, has a moral dimension as well. Without time there is no history, and history is serious business. That is something that Richard and Erna Flagg understood. German history nearly annihilated them. In American history they found a safe haven. The clocks in the Flagg collection—Renaissance and Baroque baubles, fine-tuned and sumptuous and anything but silly—are timepieces that have defied the ravages of time. When you study these glorious products of a lost aristocratic world amid the democratic perspectives of a Midwestern museum, you are reclaiming, in your own time, the origins and vicissitudes of time.